Firstly, thank you for choosing Align Physical Therapy to guide you through your recovery. If you plan to utilize your health insurance, we will need you to provide a few things at your initial visit. Please bring a prescription from your referring provider, your insurance card, and a photo ID. We also will require you to fill out a few medical forms, either in advance, or when you arrive. Both the Medical History form, and applicable Assessment Forms are available on our website. At your first appointment, your physical therapist will discuss your symptom history, and how your condition is limiting your activities. She will then assess your posture, movement pattern, flexibility, strength, balance and discuss your goals for recovery. Your physical therapist will explain her findings and determine a plan of care, actively involving you in this process. In this visit, she will perform a treatment intervention and initiate a home exercise plan.. Your therapist will also determine the frequency of future visits and predict the duration of care. 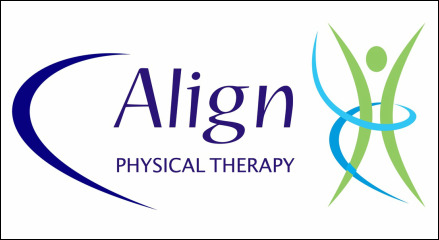 At Align Physical Therapy, we take care to create an individualized treatment plan to address a patient’s personal goals as well as their unique limitations. The answer to this question varies largely, depending on each individual and their objective findings at the initial evaluation. Align’s physical therapists always communicate their treatment plan with their patient, after the initial evaluation is completed, to ensure their patient is both in agreement with the plan, and part of the decision making process. In general, people with more severe impairments or complicating conditions may take several months to make sufficient progress. In a simple situation, as a wellness/consultation visit, one or two visits should suffice. For conditions accompanied by pain, we often suggest 2-3 sessions/week in order to both help manage your pain and progress your function at home. We recognize, however, that this can be difficult for some people to manage, and work hard to overcome scheduling, financial and other potential difficulties in assisting you through the rehabilitation process. Manual therapy is a treatment approach utilizing the therapist’s hands to promote flexibility and movement within the musculoskeletal system. Align Physical Therapy recognizes that manual therapy combined with therapeutic exercise is more effective than exercise alone, in both short and long-term research studies. If you prefer to utilize your health insurance, we will need a prescription from your doctor. We also recommend calling your insurance company in advance to determine your copay and deductible. For patients who choose not to utilize their health insurance, secondary to high deductibles or wellness visits, simply call or email for an appointment! We participate with most insurance companies, including Medicare, Blue Cross, United Health, Tufts, Cigna, and Worker’s Compensation. While most insurance companies will endorse physical therapy, there may be limits or pre-authorization requirements, depending on your plan. The best method of keeping informed is to call the customer service number on the back of your insurance card and ask about your physical therapy benefits. Please note that the majority of insurance companies require a prescription from a referring physician prior to attending physical therapy.